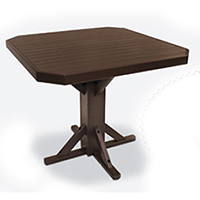 Liven up your home’s or business’s porch by installing a few outdoor pub tables and chairs. These tall, high-top patio dining furniture sets provide plenty of surface area for large groups of guests to gather and conveniently place their food or beverages. The towering, round countertops give everyone a seat at the table and are thoughtfully designed to encourage discussion. From the onset, Freedom Outside Furniture has been on a mission to provide high-quality furniture with a reduced environmental impact. Our all-weather bar-height patio dining set is crafted from durable, eco-friendly material and will withstand any of the elements it’s exposed to. We melt down recycled bottles and milk jugs to create high-density polyethylene (HDPE), which is then used to craft our poly lumber bar-height tables and chairs. If you think recycled plastic won’t last, we beg to differ. Each of our products comes with a standard 35-year guarantee to not crack, break, rot, splinter or peel! Order today and upgrade your outdoor space!